30.10.2015 Kits for self soldering will be prepared. If you want one mail asgi99 at gmx.de. 01.06.2013 Turbo-Sound GAL available, for operatin 2 cards -> 6 sound-channels. Sold by sellmyretro.com. 28.12.2012 English manual now in the download section available. 20.12.2012 MrX is now sold at http://www.sellmyretro.com/ just search for MrX. 03.12.2011 Download section now active. 17.11.2011 Hurra! The latest prototype works. This will go into production after some tests. 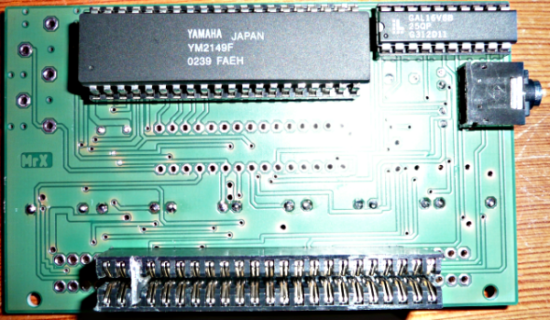 01.10.2011 Improved layout for a standing version finished, prototype PCB is ordered. 08.08.2011 PCB arrived! Soldered works.